JOINT BASE PEARL HARBOR-HICKAM, Hawaii — When war remains arrive at the Defense POW/MIA Accounting Agency to be reunited with waiting families, there’s always a question: How do they know for sure who it is? 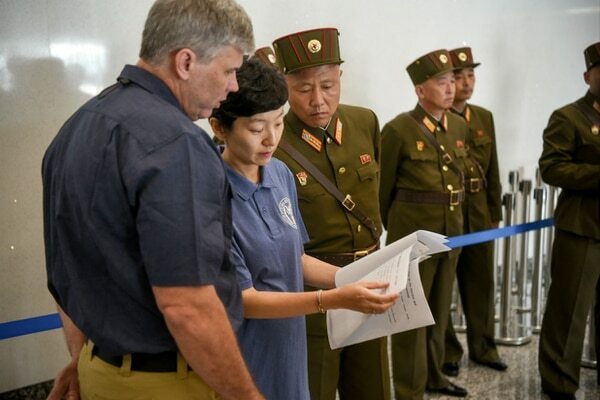 DPAA laboratory director John Byrd and forensic anthropologist Jennie Jin, who leads the Korea War team, walked reporters through the science behind how they will identify 55 boxes of remains returned by North Korea this summer. 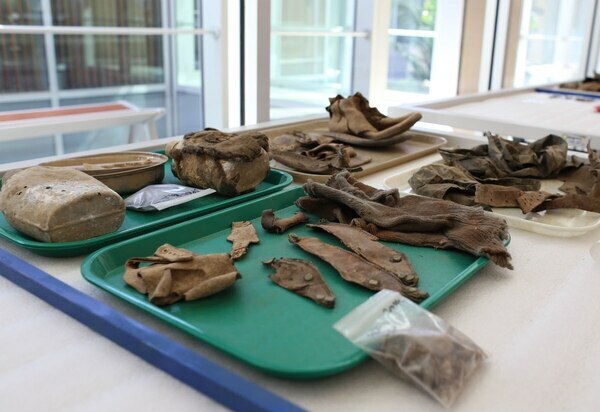 At DPAA’s lab in Hawaii, each box of remains was delicately laid out and tagged on lab tables. Some tables just had thin, broken fragments of arm bones. Others had intact femurs, some teeth or even parts of skulls. None had a complete skeleton. There were 20 boxes from the November 1950 Battle at Unsan, where 1,700 service members remain unaccounted for and 35 boxes from the December 1950 Battle of the Chosin Reservoir, which still has 1,100 unaccounted service members. There are rare cases where bones come back with such high levels of preservation that clues, such as height and teeth, enable DPAA to identify them quickly. That was the case with the first two IDs that are expected to be announced this week. But for most of the tables, the lab will have to do further testing. Mitochondrial DNA and Nuclear DNA testing: There’s two types of DNA that can be extracted from remains, mitochondrial and nuclear. Even bones 70 years old can still have a service member’s DNA in bone cells. But collagen is susceptible to decomposing, especially in warm climates, Byrd said. 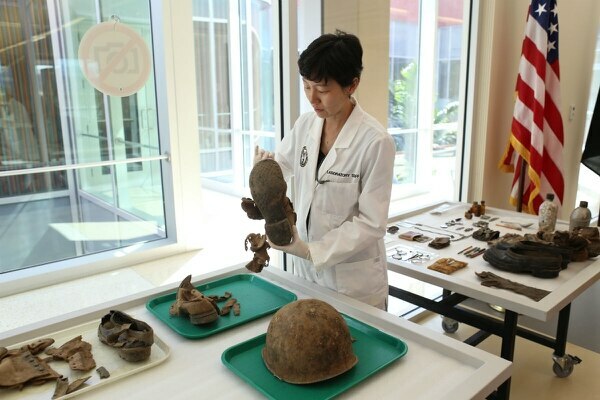 It’s made DNA testing for Vietnam War remains much more difficult. In the Korean War, the odds are better because of North Korea’s harsh winters. The two sets identified were from the November 1950 Unsan battle during the Korean War. When bones arrive at the DPAA lab, Byrd and Jin assess them for the likelihood that there’s good candidate collagen remaining. If there are good candidates, they slice a small, square section off to test. Of the two types of DNA, nuclear DNA is much harder to find. So the lab starts with mitochondrial testing. Mitochondrial DNA is found in the cytoplasm surrounding each cell’s nucleus, and is only passed from mother to child. But it’s not unique to a person, so depending on how common the strand is, may not be enough to identify remains, Jin said. If service members had a rare mitochondrial DNA, much like an unusual last name, they will be easier to identify, Jin said. Jin said they have mitochondrial DNA family samples for 7,000 of the 7,700 service members still missing. Of that 7,000, “we have 404 guys matching that they have the same exact mitochondrial DNA," she said. Which means they then have to take an additional step with those remains. If they can find nuclear DNA in the bone it will provide markers to both mother and father and they can test for both those markers. “You get a very powerful result” of exactly who the bones belong to with nuclear DNA, Byrd said. But there’s only a handful of labs that can run the DNA tests - so DPAA looks for other ways to verify bones. Stable Isotope Analysis: It turns out what you eat and drink leaves markers in your body too. And science has advanced to the point that it can not only identify your diet, but also pinpoint where on the globe you lived, based on the specific isotope signatures left by different types of water. Isotopes are variations of some of the most common elements, such as oxygen, nitrogen and carbon, that make up the atoms that make up a bone. By looking at what variations of isotopes are in a bone, scientists can now tell diet, which can be helpful in separating U.S. war remains from other nationalities, Byrd said. Different water sources around the globe leave different isotope variations in a person’s bones, and now those variations are plotted on the equivalent of a topographical map. By matching the variation to location, “we can help place where you were at some point,” Byrd said. That signature was recently used to confirm the identity of a U.S. pilot killed in Vietnam, he said. Because of the additional answers isotope analysis provides, Byrd said that DPAA is investing in its own isotope spectrometer to increase the number of human remains it can test. Right now the tests are run by the University of California, Davis. The system should be installed by next year, and once up and running, “we’re going to use as much as we can to solve some of the real vexing puzzles," Byrd said, and get closure for more families.